The tightly contested title game had gone back and forth all afternoon. No team had held a large lead and defense, not offense, and ruled the day. In the closing minutes of the fourth quarter, our press had finally worn down the other team. We were able to convert several steals into fast break baskets. Finally, in the closing seconds, several free throws had put us up by three with only one possession left for our opponents. So that’s what we did. When the team threw the ball in bounds and saw our defensive alignment, they froze. The play they had drawn up did not anticipate five defenders playing five feet above the three-point line. Their desperation heave – in the face of outstretch arms – bounced harmlessly off the backboard and our team celebrated the first state basketball championship in our school’s history. Our focus on defense in that moment won the game. continuing to invest when the stock market is experiencing a downturn. However, success in our personal financial lives is not always about looking to score. Sometimes we have to shift our emotional and mental focus to playing solid defense. This keeps our opponents from scoring on us, or maybe put more accurately, taking advantage of our mistakes. Believe me when I say – and you know this – our opponents have developed some outstanding strategies to break down our defenses and get us to buy their wares. These types of messages are designed to play on our emotions and entice us to buy. We succumb to these messages because we let our guard down. We don’t understand the game situation (our current financial position), nor the tactics advertisers use to draw us in. Next thing we know, we are waste deep in a money mess and have to work really hard to come from behind. So the takeaway is simply to stay alert. Be aware of advertisers, stores or salesmen who are trying to find a way into your pocketbook. Lock them down with some good defensive resistance. Put up your guard, get your hands up, box out and move your feet. You will find yourself on the winning end if you do. What’s your best defensive strategy to avoid getting in financial trouble? 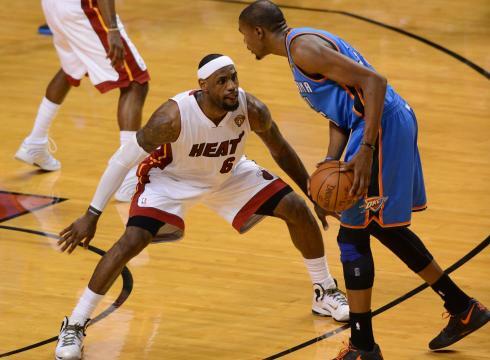 Which are you better at – playing offense or defense? Brian, I think you’re a very gifted writer. It’s a great way to think about personal finance. This analogy extends to all area of life, now that I think about it, it’s even in the bible. I believe that good ‘D’ trumps good offense. Thanks for the great picture. That’s a great point Peter! Of the 6 things we have been given to fight our spiritual battles (see Ephesians 6:10-17), 5 are defensive in nature. Only the “sword of the Spirit” (aka the Bible) is an offensive weapon. I’ve always found that interesting. It would seem God knows we will be defender ourselves a lot. Haha I could picture their faces when they saw your defensive formation. I’m sure the coach was embarrassed. I actually wrote a post about this a few months back and referenced the time the Pistons beat the Lakers in the finals (when they had Shaq, Kobe, Payton and Malone). Defense really is the best offense. That’s what I remember about the championship teams of the Lakers and Celtics in the 1980s (really dating myself there). They turned defensive steals and rebounds into quick fast break points. A good defense protects your money, but to be financially independent you also got to have an offensive game plan. Look at the Spurs they are always good on defense, but are still winning because their offense outpaces everyone else. I agree Charles…both elements are important for success. I think there are certain times when we focus more on one than the other. I’ve been thinking about this post idea because of the Christmas spending season we are in. Statistics show a great many people actually purchase items for themselves while shopping for others. I have to believe some of that comes from emotional spending moments when we let down our guard. So for me, the holiday season is a great time to play defense. Great analogy Brian! Though to be fair, I love talking about money and I love sports…so this was perfect for me. 🙂 Being alert is incredibly vital in terms of money matters and can help you play defense. I think also knowing that marketers (me being one of them 😉 ) can do things to trick you in to spending more than you ought is a powerful tool to have and can help you make more informed decisions. I think the average person does not realize how much money companies invest in marketing their products – from packaging, to advertising, to simple things like shelf placement or floor positions in a store. They don’t often make mistakes with this stuff because they’ve tracked consumer behavior for so long. They know our tendencies. There is a reason the Kraft Mac n Cheese, fruit snacks and sugar cereal is on the bottom two shelves at the grocery store…right at eye level for the prime consumer target – children. I think every child should try something sports related at some point in their life, if for nothing else to try it out and learn lessons about teamwork, discipline, effort, etc. As a San Francisco 49ers fan, I know the value of a good defense. I think a synonym for defense would be consistency. I think that a good defensive, consistent strategy would be to wait 24 hours before you decide to make any purchase. Think about what it is that you want, then give yourself 24 hours before you buy it. That type of patience can keep you from making a horrible deal. I had the 49ers defense/special teams as my fantasy starter this year…was pretty pleased. I’d agree on the 24 hour rule. We’ve used that on several occasions and it’s helped us avoid purchases we really didn’t need. Nice sports analogy. It does take offense and defense, no doubt! Also like sports, it can help to avoid making mistakes. Sometimes, going for the big play too often can be problematic. As in baseball, if we swing for the fences too often it’s not as good as getting on base at a higher rate. Mistakes can be hard to recover from in many cases, often simply due to the math, so that’s my version of defense. “…going for the big play too often can be problematic.” I love that extension of the analogy. I’ve swung for the fences myself on a couple of occasions only to come up short. In the end, consistency (getting on base at a higher rate) is more likely to win the day. Without a doubt, I think I am better with defense than offense. I ponder purchases far longer than normal people do, and always make sure they are worthwhile. Even if something is on sale, I wonder if I can get it for less, or if the product is still really worth the price. Just because it’s discounted or promoted in an enticing way doesn’t mean it’s right for me to buy. I like to protect my wallet! My biggest offensive action is committing myself to paying off my student loans. “…I ponder purchases far longer…” I think that’s good E.M. Nothing wrong with waiting on a major purchasing decision. We’ve even implemented a 24-hour rule on occasion. If it’s something we really want and it exceeds a certain price limit, we take at least a day to think about it. Often we realize after 24 hours we really aren’t that excited about it anymore. Love the analogy, Brian! Over time, I think I am equally skilled in offense and defense. My father taught me how to play defense through helping me understand money is emotional and I should set goals and focus on what truly makes me happy, instead of the Joneses. Becoming a financial advisor helped me understand the stock markets so I don’t panic during downturns, nor get too aggressive during upswings either. But I agree, most of us have become hardwired to respond favorably to messages of discounts, must-have pronouncements, or 3 monthly payments and we need to have stronger defenses to marketing offenses. And it’s so easy to get sucked into these promotions. I’m a sucker for the buy-one-get-one offers at the grocery store. I end up coming back with stuff on my list I never intended to buy all because I could “get one free.” I wonder if people realize how much money companies pour into their marketing efforts to get us to purchase their goods. They have become experts at hitting out trigger buttons. That’s an incredible story! Definitely very counter-intuitive to push that far in front of the three point line and I’m not surprised the other team froze after seeing it. Great analogy to marketers. They are always on offense! Everyday companies market to us with slogans, visuals, incentives, etc. It’s so easy to be sucked into purchasing their products. Love this! I think I try to play offense and defense equally. As far as defense I try to avoid certain spending trigger stores, and unsubscribe from tempting sites like Groupon and Living Social. On offense I try to find ways I can earn more money. I think they are equally important as well Tonya. Our job is knowing how and when to play them. Totally agree. And I love the analogy. I would add that things like an emergency fund and insurance also play a crucial role in your defensive strategy. That’s a great point Matt. Those are definitely two defensive pieces of the puzzle. Love this, Brian. We are definitely more defensive players in regards to our debt, batting off those temptations to spend when we know the money will be better utilized for debt payoff. It’s tough, but as you learned on your team, practice makes perfect. That’s right Laurie…and the more you practice the more you are prepared for all types of contingencies.